« Where are the daily puzzles gone? – use digits 0 to 9 to solve this one! 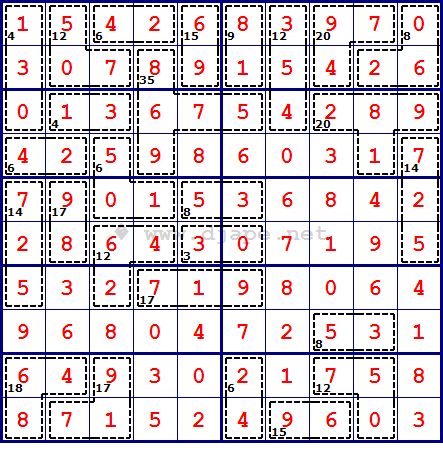 PDF Version of this puzzle: Killer Sudoku PDF And remember, the rule of 45 still applies! Be careful when analyzing possible cage sums, the addition of the 0 changes the game completely! Example: 3 over 2 cells is not necessarily 1+2 anymore! It could also be 0+3!!! Like it? 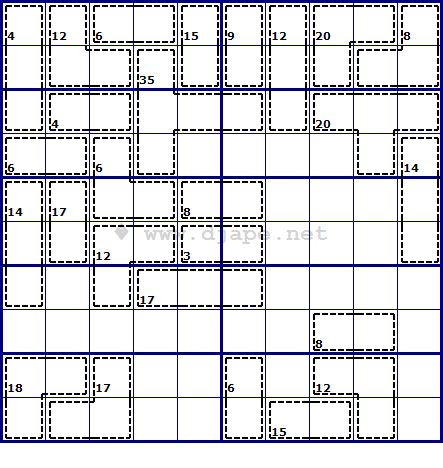 This entry was posted in Free sample puzzles, Killer Sudoku and tagged killer, killer sudoku, PDF, rule of 45, Zero Killer, Zero Killer Sudoku. Bookmark the permalink. Post a comment or leave a trackback: Trackback URL. Good luck with your Ph.D.! And I hope that you can return to typical schedule soon. I enjoy the gradual progression in difficulty of the Killers and the many Sudoku variations. I have bought five of your Kindle games, and I am now migrating more to an Android tablet. Any chance of getting the games adapted for those devices?